How happy is Oz that his annual senior dog wellness exam falls during October when it is Pet Wellness Month? Oz may not look happy in this photo at the vet’s office yesterday but I am very happy. The vet says that Oz is in excellent health for a 12 year old senior. His heart is strong, his body is strong and the vet only found evidence of arthritis in that paw Oz broke so many years ago. The only thing we don’t know yet is the status of his bloodwork but the vet thinks it will come back just fine. At this senior dog wellness exam, it was noted that Oz lost one pound. The vet also noticed Oz’s bald spots from his last allergy flare-up. This led to a discussion about Oz’s diet and exercise. My vet fully supports Oz being on a raw diet as he feels it is best for Oz to avoid grains to help minimize his allergic reactions. We discussed how much Oz eats as well and I let the vet know his appetite has not changed at all. We think he lost the pound due to increased exercise since the weather has been becoming less humid and hot. We encourage all pet parents to take their pets for an annual wellness exam to maintain good health and detect any problems early. The earlier you catch a problem, the more likely it can be treated with less difficulty and less expense. Do you take your pet for annual wellness exams? Well done Oz...passed wiv flying colours!!!!!! My annual checkup in is July! I got an A+ rating, but unfortunately I have a lot more arthritis than Oz. 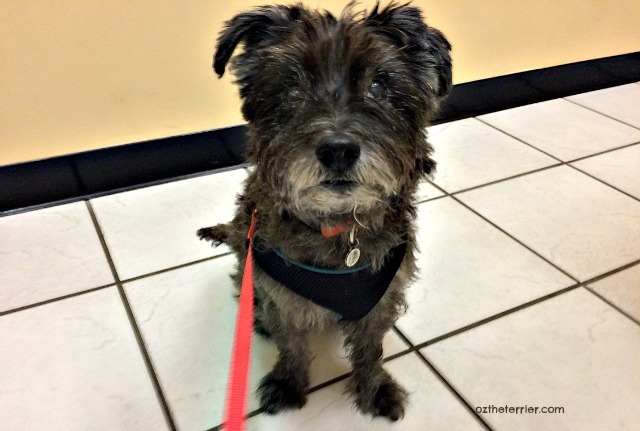 A terrier that's 12 and cancer free is great! Well done, O. You really ARE "the great and powerful Oz." I get annual wellness exams, too. Paws crossed my next one will be as good as yours! We're just beginning to 'hit' the senior years with Bella. We go next Tuesday. You are The Man, Oz! WooooHoooo! That is FABulous news dude!! I gots my senior checkup a couple of weeks ago, and I was a-okay! Wells....except for my ear and my fat arse! though, I have lost two pounds, and Ma suspects I have lost even more since then! these check ups are sooooo impawtent, cause they can find problems before we doggies show any symptoms. Always gets your blood work done! Yay for Oz's great news! Yes, we always take the crew for their annual exams. For the seniors, we also have the extra blood tests done too, just to be sure everything is looking good, inside and out. You look Oz-some to us! Our mom fully supports annual vet exams! Also, once I enter our Senior Care program, I'll go in every 6 months. I think it's because our vet really likes seniors and wants to see them more often. Do great to hear you had a great visit!!! I've always taken the chi boys for annual wellness exams. Wonderful to hear Oz is doing so well! 12? You cannot be 12! You don't look older than 5!! CHEERS to Oz for a good check up!! This post is a perfect reminder that our seniors really need their check ups -- You never know what will pop up. Our seniors, when they get to be about 14, are taken in every 6 months just to make sure nothing is being missed.